We do not do the faith, the faith does us. We do not do the liturgy, the liturgy does us. As an Army Chaplain, I often teach why we “liturgical Protestants” do what we do, by making using that phrase: “We do not do the faith, the faith does us.” And then I use the Army itself as an analogy they all understand: “We don’t do the Army, the Army does us.” What does this mean? It means that the idiosyncratic and personal feelings about individuals in the Army must submit to the greater “body” that is the Army. Why? Because only as a single-minded body, the Commander in Chief as the head, is the Army truly effective. So also the faith. And it’s the liturgy where the rubber of this principle hits the road. Further, if Jesus is truly present in the Church (which He is) bodily (which He must be, else we embrace an antichristian teaching, as St. John teaches), and is siting in heaven (which we confess Him to be), then we must be with the angels in heaven during the liturgy. The point is, the Gloria in Excelsis and Sanctus – those being the only words we know angels are singing in heaven (along with “This is the Feast”) – are going on whether we, or the creative worship team on Thursday night, decides to put them there or not. The question is whether we will confess and join this reality or not. In any event, the words of Isaiah were expanded. Why? Because old wine skins can’t pour new wine. Jesus and the Gospel have fulfilled the words of Isaiah and expanded them. Also, the liturgical form adds the words of children on Palm Sunday. Hosanna in the highest, blessed is He who comes in the name of the Lord. The song of heaven becomes the song of children. Of course! Because heaven and earth are brought together as one in Christ. The Sanctus truly has everything in it, like the liturgy in a nutshell. It begins with the Trinity. “Holy, Holy, Holy” it begins, and then refers to “His” (i.e. One) glory. Three in one. It teaches the incarnation. For, who is He who “comes in the name of the Lord.” About the first third of the liturgy is about the name of the Lord, from His invocation, to the Kyrie, to the Gloria in Excelsis, to the Creed. Jesus is the “one who comes” in the flesh down to us, in this Triune Name. It teaches Christ’s salvation for us. For He Who is among the “Holies” comes in the name of the Lord to save us. Hosanna is Hebrew for “Please save us!” based on the Hallel hymn sung by Jews on the way to Passover (from Psalms 113-118). It teaches the power of Christ’s crucifixion, resurrection, and ascension. For how it is possible we are able to be in heaven in the midst of a Holy God joining the angels? Isaiah almost died when he was in this situation. We are granted this through Christ’s blood, and in His resurrection and ascension, we are lifted up to God’s right hand in Christ, at “Ground Zero” of this mystery. And the fact that this beautiful canticle comes just before communion validates everything. Communion is the powerful, public “testament” to this truth. It’s Jesus’ Body and Blood, His resurrected Body and Blood, which is given and shed for us, which we take into ourselves, becoming in communion with Him. The holiness of heaven itself goes to the heart of our being, lifting up our hearts, minds, and bodies to where Jesus is. For where the head is, there the members be as well. Getting back to Palm Sunday, those words place us among the children awaiting their Lord. This is our Passover. This is our Messiah. 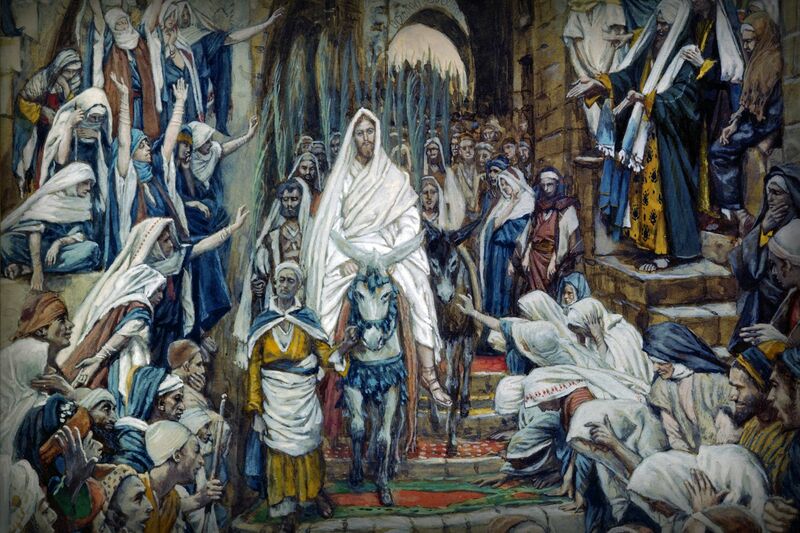 This is our account: Jesus coming as King to give Himself for us, for our salvation, to answer our hosanna. The liturgy is the time warp that puts us right there in the past, as well as in the heavenly realms of the future, all right now in the liturgical present.